Ammon Bundy, son of embattled Nevada rancher Cliven Bundy, said some of the dead cattle the family found after the federal government backed down from a tense standoff over a week ago had been shot as many as five times – seemingly more than necessary to kill the animals. A BLM contractor hired to round up the animals did not respond to a voicemail about the allegations. A spokesman for the BLM did not respond to a request for comment. Helicopters are often used during cattle roundups and their use for this activity is controversial. The Associated Press reported in June of 2013 that the BLM was taking comments and suggestions about its proposal to use helicopters to help gather wild horses over the next two years. 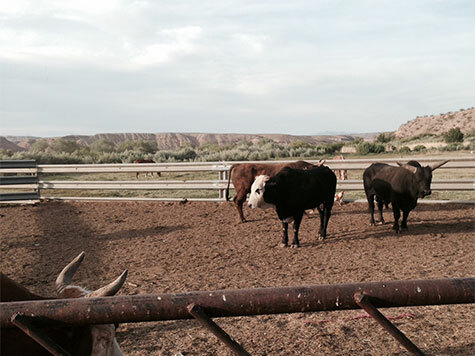 Bundy described how he thinks the helicopter roundup killed Bundy Ranch cattle. Bundy believes that is the reason why the ranch has at least 27 calves that they know of that were separated from their mothers. At this point, the ranch staff and the family can’t find the mothers to the calves. “So there’s that issue, because its just inhumane how they gathered the cattle. We do it through a trapping process. It’s very humane to them,” he said. Several of animals inside the enclosures at the Bundy ranch appeared to have their hides torn and limped along due to injuries to their legs. Bundy claims the injuries to the cattle were caused by “contract cowboys” dragging the animals. “We actually have a bull in the corral that was drug pretty hard and he’s hurt and he’s still alive. They just drug him and his skin came off and then with these animals that are in these graves, all of them all of them were drug and,” said Bundy. Bundy explained that cow’s neck won’t usually break, but when he and the staffers at the ranch rope a cow, they put the rope around a leg and then around its neck. A BLM official sent a statement to Breitbart News on Monday confirming the Department did “euthanize” two Bundy cows and two Bundy bulls. One cow and one bull, according to the official, died during the round up. “The Bundy branded bull that was euthanized posed a significant threat to employees during the gather. The Bundy branded cow ran into a fence panel injuring its spine and was euthanized,” the official wrote.